Traditionally, emigration was a lifelong commitment to settle in a land far away in the hope for a better life. These days, there are as many reasons as there are individuals. Whether love, money, opportunity, adventure or career move, the actual step of packing up your belongings and moving abroad, to survive in a different culture, requires a solid dose of courage and at least as much preparation. 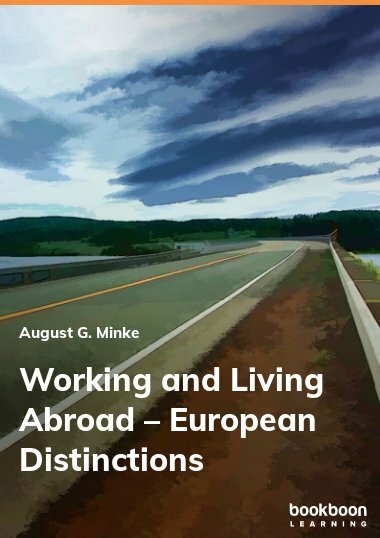 This book is a very sensible concise guide aimed at European nationals who want to work abroad. The book is admirably clear in addressing the issues that arise when moving abroad. August G. Minke, Esq. is a consultant to European companies establishing a presence in the United States and worked with renown American law firms involved in international litigation with European aspects. He also trained corporate expatriates on successfully conducting business abroad. Mr. Minke has lectured on cross-cultural aspects of conducting business and occasionally serves as a resource for expatriate cross-cultural trainings for renown cross-cultural and language institutions and companies. Before moving to the U.S., Mr. Minke worked as a corporate lawyer and business manager in the Netherlands, Belgium and Germany, as well as for the Dutch Justice Department. Initially based in New York, he currently operates from Orange County, California. August Minke holds degrees of Master’s in Law (LL.M.) from Universiteit Utrecht in the Netherlands and from Pace University in White Plains, USA, where he also obtained a Certificate in International Law. Of Dutch and Belgian descent, he grew up both in the Netherlands and in Belgium, as well as in Indonesia.